... of awards, that is. 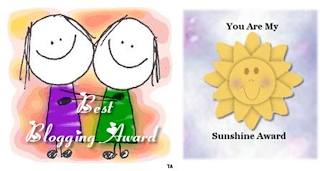 A huge thank you to Jenjen at GottaLoveMom for these wonderful awards that she's heaped on me. Jen is one of the sweetest mom bloggers I've met. You could simply tell that from her posts about her crumbcatchers, her family, and from her beautiful photos. What's more, she always takes the time to leave thoughtful comments and kind words. Hop on over to check out her blog say hello!